In recent years the number of full service restaurants in Olgii have increased significantly. Only 4 or 5 years ago there was none. Today, there are at least 6 restaurants with full menus, waitresses, VIP rooms, and bars, including restaurants in the bigger hotels and ger camps. These range from local Kazakh and Mongolian fare to Turkish and International options. The old canteens or ‘guanzes’ that existed before are still widely available also. They offer standard options of buuz (steamed mutton dumplings), hoshuur (fried mutton pancake), and tsavan (mutton with noodles and carrots) washed down with suutai-tsai (milk tea) or koumis (fermented mare’s milk). Between the full service restaurants and the guanzes is a range of limited service cafes that span the spectrum. The best option is always to eat with a family. Kazakhs have many delicious meat dishes that they make for special occasions. Pamukkale Turkish Restaurant: Ran by a man from Turkey, it offers Turkish, Kazakh, and Mongolian meals for reasonable prices from 10 am to 10pm. Wifi available, No alcohol. A coffee shop located behind the restaurant with lattes made from freshly ground coffee beans, along with smoothies, Turkish teas, and cakes. Blue Wolf Restaurant: In front of the Blue Wolf Ger Camp, services Kazakh, Mongolian, and International meals catering to foreigners. Serves breakfast, lunch, and dinner. Live entertainment during the summer months. Located 1 km south of the center on the road to Hovd. 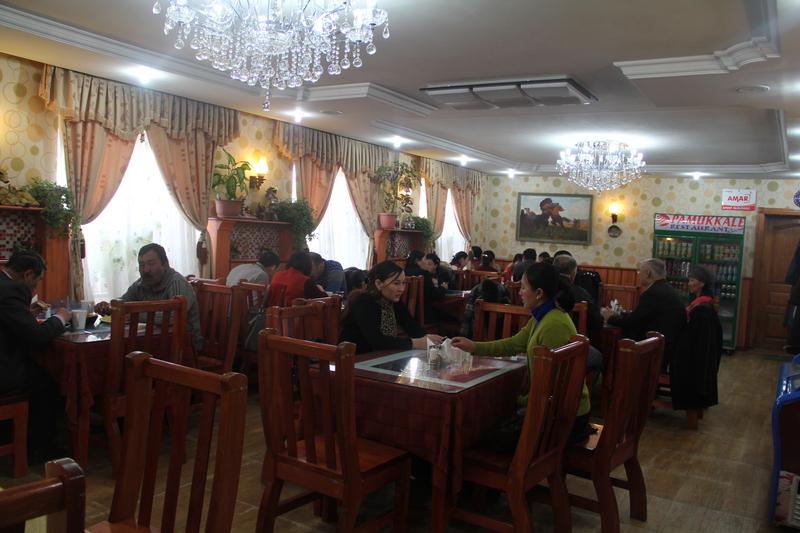 Uighur Guanze: Though it looks like a guanze, this small cafe serves a large menu of soups, noodle, and rice dishes from the small Uighur population. Located near the market, walk past the gate, turn left, and it is the small cafe on the right. Guanzes all offer the same menu for similar prices. 5 or 6 buuz or 4 hoshuur and a milk tea will cost less than 3000 MNT ($2.50). Several are in the market and one is just west of the post office in a small brick building.